stuffed vine ball. The vine ball is stuffed with nuts wrapped in paper, wing nuts, pacifiers, straws and lots of shredded bright paper. Curly straws on top add a bit of extra preening fun. 5 oz pail. Inside you find plastic chain, pacifiers, beads and bells. 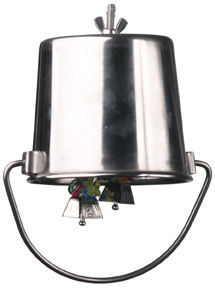 1 Qt pail. Inside are cowbells, pacifiers, marbella beads and rings. 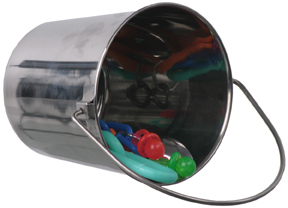 2 Qt pail. Inside are spoons, plastic chain, pacifiers, marbella beads and rings. marbella beads and rings, acrylic spools, pacifiers and cowbells. Beads spin and chain pulls back and forth for hours of fun. 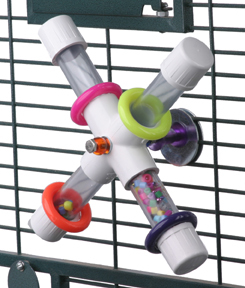 These 5 Nuts and Bolts dangling on a chain will keep your bird entertained. 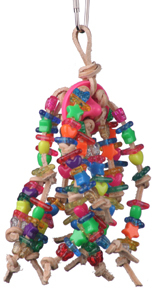 Made from 1/2” PVC, pacifiers & dominoes(or pacifiers & acrylic dice) can be pulled back and forth for hours of fun. 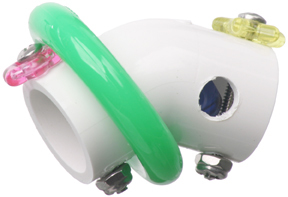 around for exciting fun.Rings click and clack as toy spins. Fastens to side of cage with washers and wing-nut. Perfect for large birds. Tons of bamboo finger traps and plastic toys laced on large plastic chain with bird-safe Polly rope. cowbells inside. 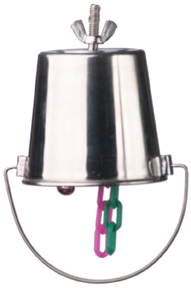 Heavy duty plastic rings, star rings and marbella beads hanging on nickel-plate chain. Hours of ringing fun. Bagels, porcupine balls, and ice cream spoons in a rainbow of colors. Ringy Dingy Spoon Toy This Hanging Spoon Toy with Bell and Beads is Perfect for the bird that loves Peanut Butter. Spread on the spoon and watch your bird enjoy! Three Munch Balls and Three Pine Cones for the parrot that loves to shred. Pine wood slats separate the munch balls. An adorable Circus Animal sits above hanging Bells, Keys, and Plastic Beads. 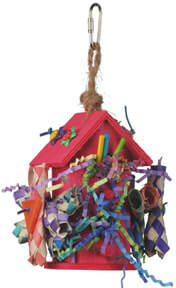 Your bird won't be able to resist shredding the whatchmacallit stuffed with shredded paper hanging on a plastic chain. This great toy has maracas with beads and plastic wheels. For the shoe lovers. This cute toy has 3 sneakers with hanging plastice beads. 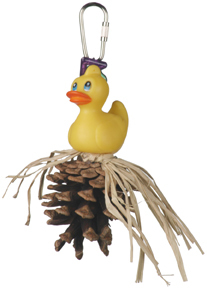 A duck sitting on top of a pinecone with attached straw. Vine Rings, Bagels, wood pieces, vine stars, and a bell. Plastic prehistoric dinosaurs and cotton rope.for tons of chewing fun. Birds are the closest related animals to dinosaurs. Let the fiesta begin! Maracas dangling with beads and straw. Hide your birds favorite treats in these adorable tea cups. Cardboard Bagel Rings and Bells for the Patriotic Bird. Colorful wooden puzzle pieces to shred for the Parakeets and Cockatiels, and Lovebirds. Wonderful foraging tubes keep birds busy for hours. Drilled with multiple holes, simply stuff with bird’s favorite treat….Almonds, Nutriberries, pellets, and watch how they get their treat out of those little holes. Easy to wash and will last for many years to come.